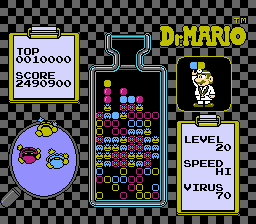 NES Dr. Mario (JPN/USA, PRG0) "all levels" in 06:44.04 by poco_cpp. In this movie. poco_cpp beats all levels, Speed Hi of Dr. Mario in record time. Don't blink, or you might miss the twist ending. The predecessor movie obsoleted by this run only beat the last level, this is why it seems shorter. But don't worry, that last level has been improved here. By 55.14 seconds.